How to determine SSD's Nand erase block size? I recently picked up a Crucial M500 240GB SSD (20nm NAND) and I'm trying to figure out the best way to partition it. Currently, I'm using fdisk -cu starting at sector 2048. I believe the nand page size is 16KB. I cannot find anywhere what the nand erase block size is for it. Does anyone know the answer to this or general advice on partitioning this particular series of SSDs? This shows the access times to do two 1024 byte reads around the boundaries of power-of-two aligned blocks. Reading at the end of a 128 MB unit takes around 735 microseconds, reading the last block of this unit together with the first block of the next one takes about 1080 microseconds and reading the first two blocks in a 128 MB unit takes around 780 microseconds. The most interesting number here is the last one, the difference between the second number and the average of the first and the third is 324 microseconds. These numbers all stay roughly the same for all units between 4 MB and 128 MB. However, from 2 MB down to 16 KB, the last column has a much lower value. This indicates that whatever the memory card does on a 4 MB boundary does not happen at other boundaries. The educated guess here is that 4 MB is the erase block size, also called the segment or allocation unit size. This erase blocksize will need to be used in other tests following this one. Similarly, both 16 KB and 8 KB boundaries are special. The logical explanation for this is that the card has 8 KB pages, but can use multi-plane accesses to read two 8 KB pages simultaneously. Some cards only show a clear pattern using accesses with certain block sizes, other cards do not show any pattern, which means that the numbers need to be determined differently. Also, cards that were never fully written may show a different behaviour because access times on pre-erased segments are different from those that have been written. The erase block size has no bearing on alignment, and the M500 supports garbage collection, so performance is not an issue. 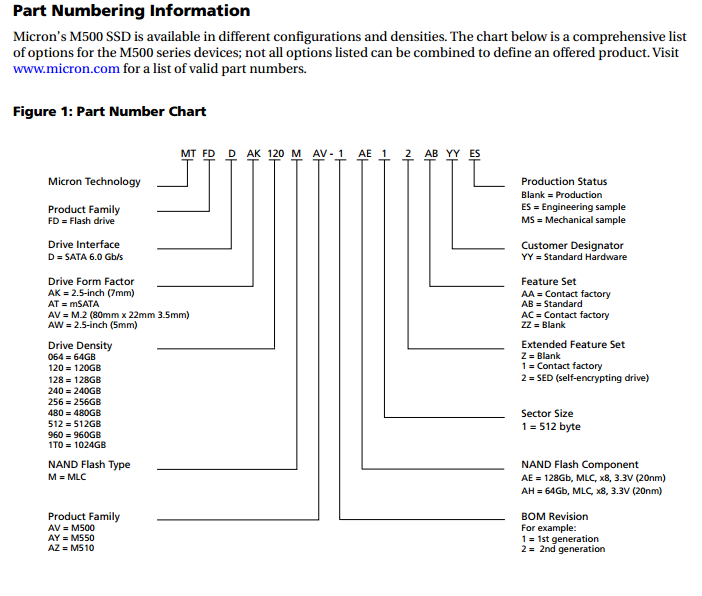 Please refer to the 2nd page of this PDF from micron's site which will help you determine erase block size based on the NAND used in your M500. as far as alignment advice, please check out this fantastic Superuser Post. Another attempt is to align on a boundary that is a multiply of any practical block size. With this concept, it is most common to align on 1MB boundary, so it won't matter if the block size is 4 or 16kb; all of these will be mulitplys of 2 and below 1M so aligning on that boundary will fit them all. However, applying this concept depends on what you are aligning; loosing 1MB at the start of a mass storage device is totally acceptable while loosing that many times in a different scenario might not be. Not the answer you're looking for? Browse other questions tagged partitioning ssd or ask your own question. do SSDs still require alignment? Are these partitions properly aligned? Is my OCZ SSD aligned correctly? Found in common SSD advice, but how does 2,048 equates to 1MB? Is partition alignment to SSD erase block size pointless?